New Ford EcoSport facelift launched at a starting price of Rs 7.31 lakh. Come with 1.5 TDCi Diesel and new 1.5 Dragon petrol engine. 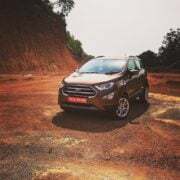 Ford India has finally introduced the much-awaited EcoSport facelift the ultra-competitive small SUV segment. The new Ford EcoSport facelift is available in a price range of Rs 7.31 lakh to Rs 10.99 lakh. The new look EcoSports compact SUV replaces the pre-facelift model to rival mainly the Maruti Vitara Brezza and the Tata Nexon. 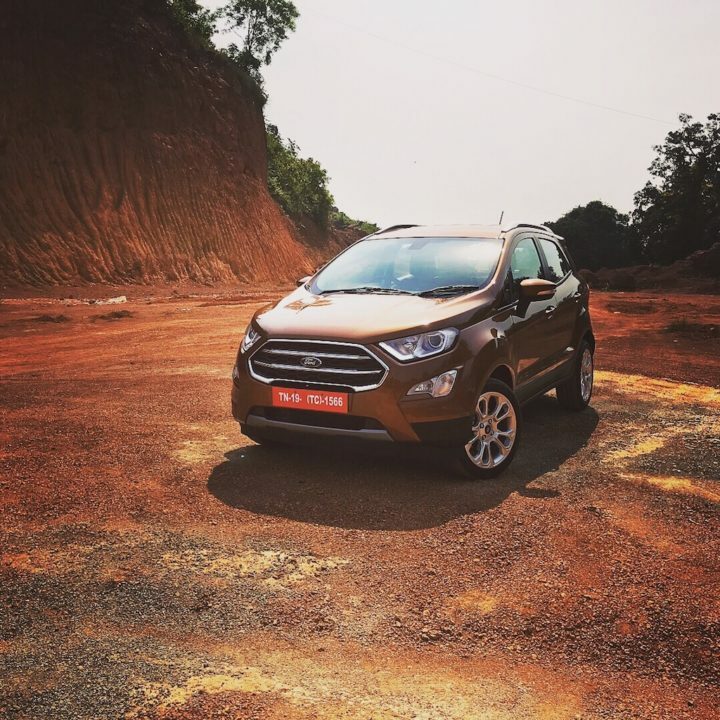 The EcoSport facelift comes with updated exterior and interior along with many new features. Another highlight of the new offering is the new 1.5-litre Dragon petrol engine that replaces the TiVCT motor. The 1.0 EcoBoost has been shelved owing to poor demand. 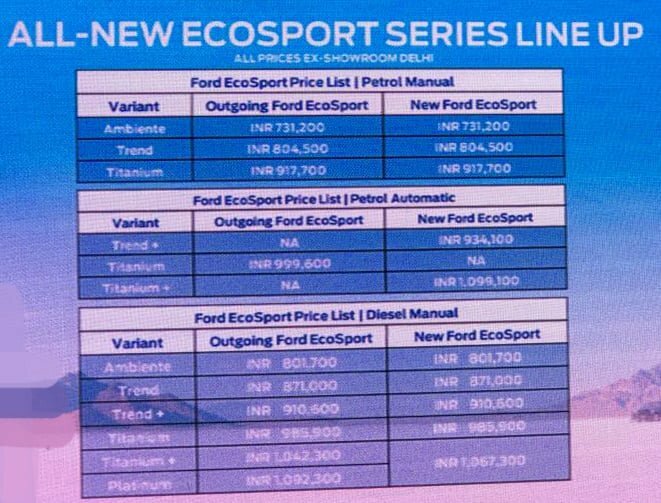 Prices of the new Ford EcoSport facelift 2018 start at Rs 7.31 lakh. The entry-level Diesel trim costs Rs 8.01 lakh. On the other hand, the fully loaded Diesel model costs Rs 10.99 lakh. At this price point, the EcoSports SUV continues to rival the Maruti Vitara Brezza and the Tata Nexon. The fresher styling, along with a host of new features and a modern petrol engine, make the Ford small SUV better value for money than before. Much like the Nexon, the EcoSport facelift offers both Petrol and Diesel engines. However, there’s no automatic for the Diesel, at least not at the moment. 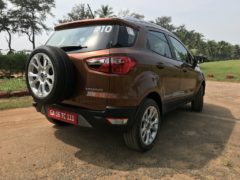 The 2017 EcoSport comes with the new 1.5-litre three-cylinder Dragon petrol engine that replaces the four-cylinder unit of the pre-facelift model. The Diesel engine has been carried over, while the 1.0 EcoBoost has been discontinued owing to really low demand. The new 1.5-litre petrol engine outputs a max. power of 122 BHP and a peak torque of 150 Nm. The Diesel engine on offer outputs 99 BHp and 205 Nm. Both the engines come mated to a 5-speed Manual Transmission. Additionally, the 1.5-litre engine also offers a 6-speed Powershift dual-clutch transmission. It may be noted here that this is the only car in its segment to offer a dual clutch gearbox. Of the two engines, it is, of course, the 1.5-litre Diesel unit that is the most pocket-friendly. The new 1.5-litre Dragon Petrol engine should offer a peak mileage of up to 17 KMPL for the Manual Transmission variant. 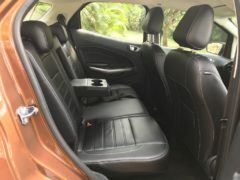 The interior of the 2018 Ford EcoSport has many new bits. 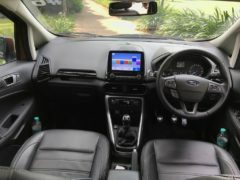 All the updates come together pretty well to make the cabin of this car look a lot fresher and hence, more attractive. The 2017 model of the EcoSport features a new dashboard, updated speedo console and many new features. The dashboard offers a grab rail for the front passenger, which is something new for this SUV. The centre stash offers many new buttons and knobs along with new design HVAC vents. 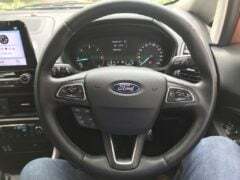 The speedo console is also new and so is the steering wheel. All these updates are enough to give the cabin a much fresher look. The biggest highlight is the new SYNC3 infotainment system that offers a touchscreen interface. This new unit replaces the SYNC unit of the pre-facelift EcoSport SUV. It offers an 8-inch touchscreen interface that can be used to control audio system, telephone features and sat-nav. Also, the system offers Android Auto and Apple CarPlay connectivity along with voice controls. This compact SUV looked fairly radical back when it was first launched in India. This was mainly due to the large twin-port grille, sleek headlamps and many taut surfaces. The facelift tries to offer a more attractive package whilst retaining all the plus points of the current car. The update brings along a comprehensively revised front fascia that has a bigger grille with two horizontal slats running across it. It also gets a pair of new headlamps, a faux skid plate, and an updated bumper. All this leads to a rather butch appearance of the nose. Not much has changed in the side profile. The only change here comes in the form of a set of new design alloy wheels. The rear-end of the facelift retains the tailgate-mounted spare wheel. Hence, the registration plate stays on the bumper. Talking about the bumper, it gets slightly updated. We are pretty sure that all the updates on the new 2018 Ford EcoSport facelift will be well received by the car buyers. The 2017 EcoSport facelift will mainly rival the above four models. Our of these, the Vitara Brezza is the one that has been resposible for leaving a huge dent in the sales of the EcoSport. Also, with the Nexon launch almost at the doorsteps. competition is going to get even fiercer in this segment. While the NuvoSport and the TUV300 don’t enjoy the mass appeal of, say, the Vitara Brezza, they are definitely clocking decent sales numbers in select pockets. The 2017 Ford EcoSport will have to deal with all these models. There won’t be any change in the dimensions and measurements of the facelift. The car will continue to measure a shade under 4-metres with an overall length of 3999 mm and a wheelbase of 2520 mm. 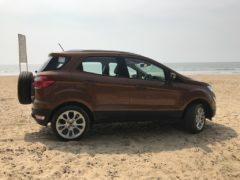 The EcoSport is 176 mm wide, which is considerably lesser than the Brezza’s 1790 mm. This car measures 1708 mm in height. All the dimensions are very likely to remain the same. So, what’s your take on the new 2018 Ford EcoSport facelift price range? Do share your thoughts with us by writing them down in the comments section below. Also, stay tuned to Carblogindia for the latest news on cars and motorcycles relevant to India.